Interest in the 109-piece collection quickly turned some H&M stores inside-out and left the store's website offline for two hours. A line of customers wraps around an H&M store on Newbury Street in Boston, to buy clothes from a collection by designer label Balmain. Demand for H&M's new collection of clothes by luxury Parisian fashion house Balmain prompted wild scenes at some stores, briefly crashed H&M's website, and had outfits going for up to triple the price on Ebay. The collection, Balmain X, was released Thursday as part of a new partnership between the businesses. Interest in the 109-piece collection quickly turned some H&M stores inside-out and left the store's website offline for two hours. The frenzy led some to question online whether H&M wasn't prepared for the large interest in the new clothes. H&M spokesperson Hallie Ruben said in an email they expected the collection to sell out. "Most of our customers appreciate the fact that the collections are limited," she said. "Within the collection there are different quantities of the various items and it is always a challenge to find the right amount for each item." Balmain's collection is headed by creative director, Olivier Rousteing. Balmain's clothes were made famous by model Kendall Jenner. The "Keeping Up With the Kardashians" star led the runway for Balmain during Paris Fashion Week in October, and starred in a commercial that has received millions of views on YouTube. Videos and photographs on social media Thursday showed packed stores and shoppers rushing to grab the highly sought-after clothes. In one video, two customers tugged at a jacket. 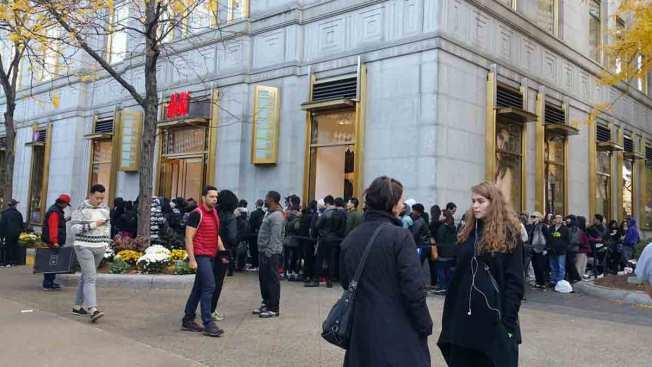 H&M's website was unavailable from 7:30 a.m. to 9:30 a.m., with shoppers greeted by a message saying the site had a lot of visitors due to the high level of interest in the latest collection. Customers were told to try loading the page again. While searching for the collections online, some people spotted the same items being sold at much higher prices on the shopping and auction site Ebay.com. A $199 Balmain "Green Sequin Embroidered Dress" was listed on Ebay for $550 or best offer. A sold-out pair of "Sandal Boots," originally listed at $199 on H&M's website, were going for almost $500 on Ebay. Ruben, with H&M, said that while they prefer selling to take place at their stores or websites, there are no laws against people selling their secondhand clothes.